Another blog post on the Peepoo bag system – the biodegradable toilet bag system for use in places where there are no toilets available. A single-use, self-sanitizing, biodegradble system that turns into fertilizer after use. A follow-up to another blog post from December 2008 from my private blog on the same subject (“Flying Toilets 2.0”), if you will, because a lot has happened since then and I wanted to find an open space to note down all the pros & cons, the advantages and disadvantages of such a bag system. You are of course invited to share your opinion on these bags and leave a comment! I also think that there’s no single truth on this subject – something I’ve learned from blogging on Afrigadget.com where we often cover gadgets that may appear to be very simple, but also still do the job. Systems and technologies do not have to be perfect in order to work, and what is sponsored by dev aid orgs and private individuals may not necessarily be appreciated by the recipients (who will accept it anyways when it comes for free). Rather, a lot of different technologies may coexist – may also compete with each other – but to condemn a system just because it isn’t 100% sustainable isn’t too fair, I think. In my books, a system that tries to close the loops on nutrients and is accepted by its users, is of much greater value than a traditional flush toilet. But that’s just me. And again, it’s not just a matter of provding toilets and basic hygiene standards, but instead so much more that can not be changed in one go. Urbanisation may be one core problem, or the question of land ownership which often results in slum dwellers having a greater interest in getting their hands on a TV set + VCR instead of a clean & secure toilet. The list of reasons is probably endless, and the following list also can not include all criticism and truth, so please free to add your own thoughts about the Peepoo system. Thank you! Most of the following points where taken from the EcoSanRes Yahoo! group where the subject has been discussed for quite some time now. There also is an interesting short report with results of a medium-scale trial of these bags in Bangladesh (PDF; 1.7 MB) which was published in GTZ ecosan newsletter no. 34 in September 2009.
bag system is patented => how do you prevent fake (= non biodegradble) bags from being sold on the market? Also, what works in Africa will also work anywhere…? That’s one of our slogans on AfriGadget, but the reality of course is that each community has its own habits. Here’s another blog post by someone who tried to brake it down for India (with additional comments by Elisabeth von Münch, GTZ sustainable sanitation & ecosan team leader). I am actually quite happy about the good media coverage that Peepoo(ple) has received lately. From a scientific perspective, things may not always be that clear and there’s always room for constructive criticism. From a blogger, user, km4dev and watsan worker perspective though, any media coverage for sanitation in urban slums is highly appreciated and still needed (one of the reasons for this blog on sanitation). What I really like about the Peepoo system is that it doesn’t require much behavioural change and adds value to something that is often only regarded as waste. Maybe it takes such an extreme low tech approach to get the message of “closing the loops on nutrients” across. And you? What do you like or dislike about these bags? Please feel free to share your comments with us. Asante sana! A semi manual production of Peepoo bags is currently being set up in Nairobi, Kenya with the aim to provide Peepoo toilets for field tests and pilots. The company Peepoople is now ready to start taking orders (send e-mail to order@peepoople.com) from the small scale production unit until the high speed production plant is up and running in mid 2011. 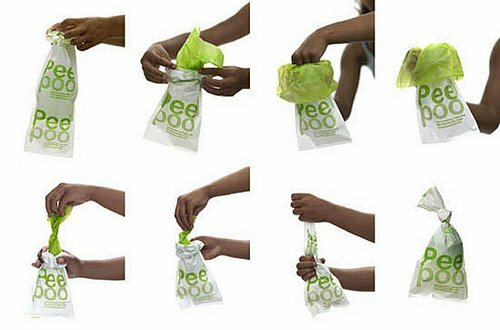 The Peepoo is a single use, self-sanitising bio-degradable toilet in the form of a bag that after use turns the human waste into valuable fertiliser in 2-4 weeks. The Peepoo toilet has been tested in Kenya, Bangladesh, India and Haiti since 2008 with very positive user results. “Dear all, just want to let you know that the Peepoo is being sold, used and collected in Silanga village in Kibera [Nairobi, Kenya] since 23rd of October…..the women micro entrepreneurs are selling the Peepoo for 0.03 EUR and a refund of 0.01 EUR is payed at the collection point” (100 Kshs. = ~ 1 EUR in late 2010/early 2011). That’s 0.02 EUR consumers are willing to spend on bio-plastic bags a.k.a. portable toilets! People willing to pay for improved sanitation (as opposed to a non-existing one, or just flying toilets) imo already is great news. Yes, the bags (and probably also micro entrepreneurs) are still subsidized and the system may not be that sustainable to some experts (even though the bags are now manufactured in Nairobi), BUT! – forget about all expert knowledge if your business tells you your heading in the right direction. Success still is the best argument, especially when it comes to questionable new approaches in sanitation in highly populated urban areas. Thanks JKE for getting this pros and cons together! This is no sanitation solution. thanks a lot for the very informative article, as you know I was never a big fan of the peepoo bags. I had once a interesting lecture at TU Dresden providing objective information about Peepoo bag to a group of environmental managers from developing countries from Africa and Asia. In a group work, the students also collected besides applicability pros & cons (much more cons). The interesting point was that the biggest criticism was financial nature: Why should people pay for a biodegradable flying toilet if they get plastic bags for free? As long as there is no willingness-to-pay for peepoos, it will be no sustainable system. Another con from my current work: As peepoos make sanitation a solid waste problem, you also need a working collection systems. As solid waste is still burnt in many slums, how can you avoid burning of peepoos? Thanks for putting the ‘pros’ and ‘cons’ together. However, I do not like the way in which you are presenting this, since you have an obvious bias for the peepoo bag and try to discredit already the ‘con’ arguments by commenting them in the list. I would like to see a scientific study that investigates the elimination of pathogens and helminth ova in situ, this means under actual conditions in Bangladesh, etc. So far, there are only results presented under laboratory conditions from Sweden; as far as I understand not even with ‘human’ helminth ova, put from pigs only. Also, the list of “cons” is longer than the one of “pros”. Re: scientific research: yes, agree, much more research needed. Will you do it? This is very interesting technology. I am involved in an activity (rock climbing) where waste management presents – er – messy issues! Though we have many options for waste disposal, they all involve bags that are completely non-bio-degradable, though effective. I have been actively seeking different options for our sport and this one definitely has my attention. Or even for forced rest-stops on drives. I am intrigued with the applicability of these bags in such situations. One thing that immediately struck my notice, having experienced “bag toilets” is the narrowness of the opening—and it sounds like that has been acknowledged. But I think were that rectified, these bags could have a use in the outdoor industry as well. And perhaps by marketing them to the outdoor enthusiast, income could be generated to the point of funding the dispensation of bags in communities that are in desperate need of immediate, albeit not long-term, waste management. what is the cost of one pee-poo bag in indian rupee?